Two deep-sea roughies, Hoplostethus (Leiogaster) rubellopterus Kotlyar, 1980 and H. (L.) melanopus (Weber, 1913), are re-described based on several specimens collected from the Arabian Sea, Bay of Bengal and Andaman Sea. Some notes on the taxonomic status of these two species are also included, and their distributional ranges are updated. Hoplostethus (L.) rubellopterus is a commonly occurring species in the deep-sea catches from the upper continental slope (160–800 m) of this region, which is often misidentified and reported as H. mediterraneus Cuvier, 1829. Previous reports of H. mediterraneus from Indian waters were found to be misidentifications, and should be referred to H. (L.) rubellopterus. Hoplostethus (L.) melanopus is found to be distributed in much deeper waters at bathyal depths (>900 m) of the Arabian Sea and Andaman Sea. We thank Kotlyar AN for his advice and suggestions for proper identification of the Hoplostethus species. We thank all the scientific cruise participants of FORV Sagar Sampada Cruises (Cr. 279, 281, 291, 305, 321, 322, 331, 334 and 338) for collecting samples for analysis. We sincerely thank Usha V Parameswaran for the critical reading and valuable corrections in the text. We are extremely grateful to Aneesh Kumar, Deepa KP for providing otolith samples. We thank all our colleagues and friends at the CMLRE for the constant support and encouragement. The suggestions and comments of the anonymous reviewers, which improved the manuscript are gratefully acknowledged. Bailly N (2015) Hoplostethus. In: Froese R, Pauly D (Eds). FishBase. 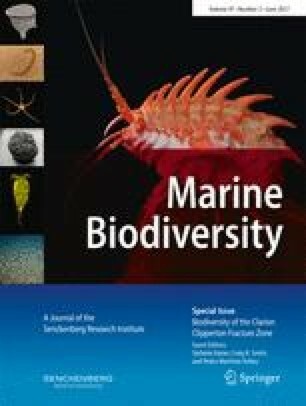 Accessed through: World Register of Marine Species at http://marinespecies.org/aphia.php?p=taxdetails&id=125706 on 2015-09-02.